Germany Recalibrates After 2 Years Of Trump Senior officials in Berlin who oversee the trans-Atlantic relationship tell NPR there continue to be concerns about the "German-bashing we hear out of Washington." German Chancellor Angela Merkel has had to readjust her government's approach to trans-Atlantic relations. In 2011, former President Barack Obama described the trans-Atlantic alliance as "The heart of our efforts to promote peace and prosperity around the world. And Germany — at the heart of Europe — is one of our strongest allies." In 2019 the world looks different. Two years after President Trump took office, the U.S.-German relationship is at a new low. President Trump has criticized Germany, Europe's largest economy, more than he has any other European ally. In his words, Germany is "captive to Russia," "Germany owes vast sums of money to NATO" and "the Germans are bad, very bad." Those remarks had consequences. "The German public has reservations concerning Trump and there is a public mood to distance ourselves from the USA," says Peter Beyer, Merkel's trans-Atlantic coordinator. "This might be due to Trump's political style and the way he communicates, but also because of the German-bashing we hear out of Washington: on trade, on defense, on natural gas, on our immigration policy." The rift was on display again this month at an annual gathering of world leaders and defense chiefs in the German city of Munich. Several German newspapers covering Chancellor Angela Merkel's speech at the Munich Security Conference ran headlines like "Merkel settles a score with Trump." Merkel criticized the U.S. for going solo on trade and foreign affairs, earning her standing ovations. Vice President Pence, on the other hand, criticized European partners for sticking to the 2015 nuclear accord with Iran, which the U.S. has exited, and when he mentioned bringing greetings from President Trump, he drew near silence from the audience. Early in his presidency, in April 2017, Trump said he had thought "one of the best chemistries I had was with Merkel." By the next month, Merkel expressed a different view after tough meetings of NATO and the Group of Seven leading advanced nations. "The times in which we could fully count on others are somewhat over, as I have experienced in the past few days," she said. "We Europeans truly have to take our fate into our own hands." 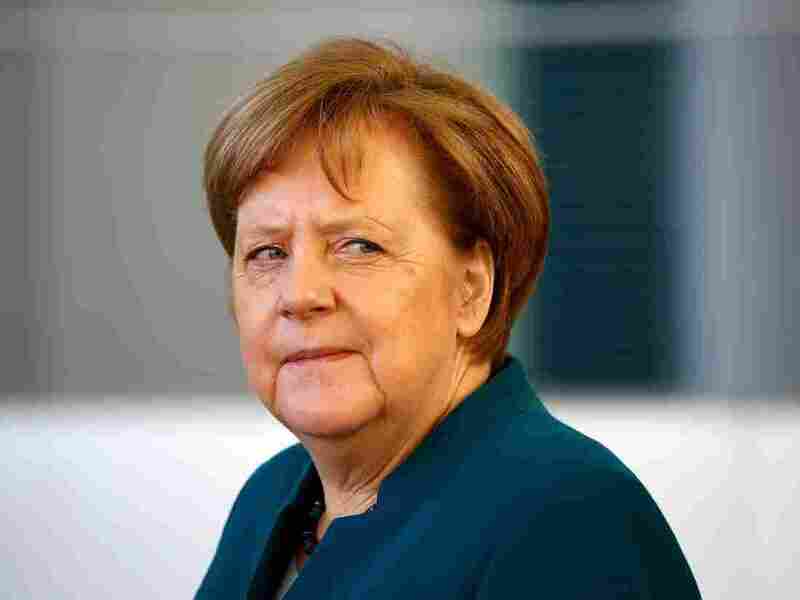 Critics said Merkel, who has stood up to many difficult men during her career, had miscalculated with her approach to the new American leader. "Merkel was wrong to believe that Trump would seek her ideas and support after settling in," says Josef Janning of the European Council on Foreign Relations in Berlin. "She did not anticipate that he would seek confrontation with Germany rather than the cooperation. Trump responds to strength and steadiness. In his view, Germany lacks both." Senior officials in Merkel's government describe to NPR the difficulty in managing important relationship with the U.S.
For Beyer, the trans-Atlantic coordinator, "Washington has become much rougher, and we have to get used to that." Niels Annen, a minister of state in Germany's foreign ministry, tells NPR, "Today, one cannot avoid the impression that President Trump considers the EU rather as an enemy than as a partner." One cannot avoid the impression that President Trump considers the EU rather as an enemy than as a partner. This impression was reinforced by Trump referring to the European Union as "a foe" of the U.S. in terms of trade. The German Federal President Frank-Walter Steinmeier has said he worries that damage to the U.S. relationship could end up being "irreparable." "Trump has destroyed a lot of trust in the trans-Atlantic relationship with his questioning of America's security guarantee for Europe and his hostile talk vis-à-vis the European Union," according to Jan Techau of the think tank the German Marshall Fund. However, he says, "The Europeans have to accept their share of the blame. Their military decline encouraged Washington to grow skeptical of Europe's seriousness in geostrategic matters." According to some analysts, the problem for Germany is that its leaders are trying to do two things at the same time. Caught between opting for deeper integration with its partners in the European Union, and using its national strength to seize a leadership role, Janning says, "Germany does a bit of both, which is insufficient on both counts." Germany's defense spending has been a key point of contention. U.S. Ambassador to Germany Richard Grenell recently accused Berlin of failing to meet its promised commitments under the NATO. Germany plans to increase defense expenditures to more than 1.5 percent of its gross domestic product by 2024, which is below a 2 percent goal agreed on by alliance members over four years ago. Techau says Berlin slept through Trump's wake-up call. "Germany plays a particularly disappointing role. It refuses to live up to its defense spending commitments, it does not fully realize how dramatic the strategic shift in Europe is, and its lack of realism starts to worry its allies and neighbors," he says. He blames Germany's reluctance to take a leadership role on recent history. "Postwar Germany learned that military and diplomatic restraint were a way to regain respectability and acceptance after the disaster of the Third Reich. Many Germans believed that this passive posture was not just a political necessity but also the morally right thing to do that others should emulate," Techau says. Trump's leadership style and the way he handles his administration pose more challenges for the process-orientated Germans. Key posts in the Trump administration have been vacant. "That does not necessarily make our work easier," says Annen at the foreign ministry, although, analysts say, personal contacts and meetings between each government's officials are going well. Ambassador Grenell appears politically isolated in Berlin. Since he arrived in Berlin in May 2018, Germans have chided him for ignoring diplomatic conventions and interfering in domestic affairs. He took flak for telling German companies to stop business with Iran, and for comments about his goal to "empower other conservatives throughout Europe." Some local media are calling him "Mini-Trump." Germany has also adapted its approach, Annen explains. "In addition to government contacts, we are making even more intensive efforts than ever for close contacts with the Congress," he says, noting that Democratic lawmakers now control the House of Representatives. "The midterm elections have shifted power relations in the U.S. President Trump has to seek compromises with the Democrats now." Other observers say looking for alternative interlocutors will not ease tensions with the U.S. administration. Germany should not be tempted to turn its back on the U.S., they say, but instead concentrate on building a firm alliance with its European allies so they can all take a strong and unified approach to Trump's Washington.